Milestone releases another amazing DVD saved from the ravages of history: On the Bowery - The Films of Lionel Rogosin. I think luck used to count for a lot more than it does today. You got to where you were going in life by chance as much as anything else. In the first half of the 20th Century, Horatio Alger’s stories were a pleasant cliché, but the conventional wisdom was: “There but for the grace of God go I.” For someone to end up on Skid Row was not so much avoidable as regrettable. It seems to me that in the last fifty years, luck has been replaced by “personal choice” and by today’s reckoning, modern bums are where they are because they are morally weak, if not outright bad people. So a film like On the Bowery, by director Lionel Rogosin is not going to be understood in the same way as when it was made back in 1956. Rogosin’s gritty look at life in New York City’s human trash bin might be seen today as an a overly sentimental, perhaps pointless exercise aimed at a group of men (and a couple women) who have made their own beds and now must sleep in them. But for someone who had survived the Great Depression and World War II, there was no explaining who won and who lost the game of life. It was just something that happened. “That could be me” is, I think, an idea that has faded during the prosperous post-war boom years. Fifty years ago, a bum was still a bum but if they were guilty of anything it was being unlucky. There is a moment in On the Bowery when a mission preacher addresses a roomful of winos patiently waiting out the sermon to get a dinner and a place to sleep. The preacher says “No man started out with a life’s ambition to end up in a drunkard’s grave.” In 1956 this would have been stating the obvious but I suspect in 2012 it is more of a revelation. Probably the only people today who would really understand On the Bowery and Rogosin are the homeless. Part of On the Bowery ‘s power comes from the fact that it does not view the Bowery from above, but at eye level, in the bars and on the street. 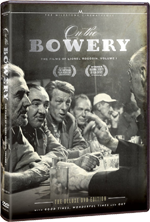 Rogosin spent 6 months on the Bowery drinking with the men he filmed before he ever started production. (In this On the Bowery is very similar to the later LA-based film The Exiles directed by Kent Mackenzie.) Sure there’s a whiff of anthropological voyeurism but there’s also Rogosin’s keen eye for such rich and ironic textures as a ragpicker reading a cast-off copy of Esquire, flop houses named “Nassau” and “Windsor” and the bottom of the barrel gin-joint called “The Majestic.” The bodies in the gutters and doorways look like Leningrad under siege and the drunks in the bars and staggering down the street are the Lost Boys grown up. For them it’s still 1933. The next 25 years in America are going to be the most prosperous time in the history of mankind and these guys are already so far out of the loop, they aren’t coming back. So if somehow you can get your head into a that-could-be-me state of mind, On the Bowery is an incredibly powerful film. I think it’s one of those moments when the art exceeds the artist’s intentions and abilities. 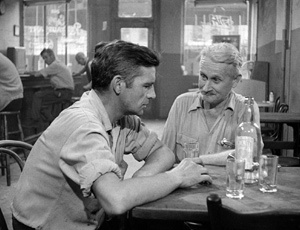 This is because the characters and situations are real and On the Bowery straddles the drama-to-documentary boundary. Does that weaken it as a documentary? Perhaps in a strict and clinical sense. But as a work of art, you’ll be hard pressed to find a better example. On the Bowery is in a class by itself and deserves to be acknowledged for the classic that it is. If luck puts this film in your path, don’t pass up the chance to see it. Also in this two-disk set are two other Rosgin films: Out (1957) and Good Times Wonderful Times (1964). Out is a more straight-up documentary told in a first-person narrative of refugees from the Hungarian Revolt of 1956 who are living in Austrian camps and waiting to resume their lives somewhere else. Here, like On the Bowery, luck has landed these people where they are and luck will get them (hopefully) out. It is easy to see that the same hand made both films. Good Times Wonderful Times is Rosgin’s 1960’s anti-war film. Made before the Viet Nam era really got rolling, its main concern is the absurdity of war and in particular the threat of what was then known as “all out” nuclear War. Central to that theme is the British “ban the bomb” movement for nuclear disarmament. That was the origin of the peace sign — the thing that is now affixed to the Hippies and the anti-Viet Nam War years. Good Times Wonderful Times is an interesting bit of time-travel, though nowhere near as powerful as On the Bowery. It is an instructive example of what the ’60s were really like rather than the current flower-power version (which has more to do with the ’70s). Scenes of the previous two world wars are shown in order to put the next (and presumably final) war into context. In 1964 the “next war” was going to be World War III and just as predictions of WWII were modeled on WWI (see also: Things to Come), the model for WWIII was the previous world war and proved to be just as inaccurate. Good Times Wonderful Times isn’t in the same league as On the Bowery perhaps because outrage at the lucky doesn’t carry the same weight as compassion for the luckless. Street of Forgotten Men (1933) is a sort of newsreel/thumbnail sketch of the Bowery. Not much changes in the next 20 years. The Bowery Men’s Shelter (1972) is a short doc looking at the inside of the same shelter Ray goes to in On the Bowery. As I watched it, I thought that the men who were in On the Bowery are by now all dead and by now this group is gone too, sort of like graduating classes. Also interesting is the fact that there are many more Black men on the scene. Was there a dedicated Harlem Bowery before 1972? The Perfect Team: the Making of On the Bowery (2009) is a nice back-story piece by Lionel Rosgin’s son Michael. It’s a must-see extra feature. It shows Lionel being interviewed by Dave Garroway on the 1950s Today show. It also covers the stories of Ray Salyer and Gorman Hendricks. Also told is how Lionel assembled his crew, apparently recruiting them from the patrons of the White Horse Tavern. Now what I’d like to see would be a documentary about both the White Horse and Cedar Street Taverns (the main hangout for the Abstract Expressionist crowd of the same time). America drinks and makes art! Man’s Peril: The Making of Good Times Wonderful Times (2008) is Michael Rosgin again documenting his father’s work with “where are they now” interviews with the cast and crew. Worth the price of admission is the followup interview with Molly Parkin, the nervous and somewhat daffy woman at the ’60s cocktail party who is a spring wound too tight before Women’s Lib. I had the feeling that Molly could support a documentary of her own. All three Rosgin films have very clean restorations and are great additions to the Milestone archival catalog. I particularly like the soundtrack to On the Bowery... clear and strange at the same time. I think that for best effect, you have to meet On the Bowery on its own nonjudgmental terms. Also instructive is the idea (mentioned in The Perfect Team) that Rosgin pointed to one of Rembrandt’s elderly self portraits as an example of the kind of facial “depth” he was looking for. Boy did he get what he was looking for.